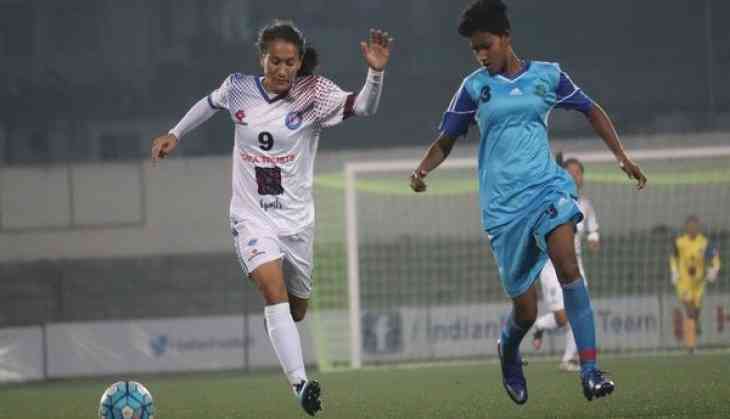 Defending champions Eastern Sporting Union clinched their second consecutive win in the Indian Women's Football League 2017-18 when they edged out last year's finalists Rising Student's Club 1-0 at the Jawaharlal Nehru Stadium here in Shillong last evening. Captain Irom Prameshwori scored the solitary goal of the match after lobbing it over the keeper's head in the third minute. With this win, Eastern sit pretty on top with six points from their two matches. Eastern Sporting Union attacked from the word go as the Prameshwori and Kamala Devi combined well in the opening couple of minutes. It yielded a goal straightaway when Prameshwori lobbed it over the keeper Tikina's head who was left stranded. Defender Sweety found Roja inside the box in the sixth minute but the striker was unable to control the ball. Kamala too unleashed a shot of her own in the 13th but it hit the side-netting only. Slowly but surely, Rising made a comeback as Sanju and Lochana combined well together. Sanju took aim in the 23rd but her shot missed narrowly. Sweety too attempted to score at the other end but her shot was easily collected by Tikina. In the 28th minute, Anju Tamang squandered a sitter. She found herself in the clear with only Panthoi to beat but a rush of blood saw her making a hash of it as she bundled her shot over the bar. Prameshwori and Kamala both came close to doubling the lead but they were unable to put it on target. The final chance of the half went to Lochana who just needed to place it but her shot went way over the bar as the teams headed into the break. Rising came out strongly in the second half as Sanju was a livewire down the right hand side of the park. The trio of Sanju, Lochana and Anju put serious pressure on the Eastern backline but player of the match Manisa Panna and Umapati Devi were on hand to keep them at bay. Sanju had a couple of chances to shoot but she wasted both of them while Prameshwori saw her shot curl past the far post. Sanju who was by far the most impressive of all Rising players had another chance in the 69th but her left footer missed by a whisker. It just wasn't Rising's day as Anju Tamang failed on her chance at redemption in the 80th before Kamala shot straight at Tikina in the 81st. Rising threw in a final roll of the dice when Ngoubi rushed down the flank in the 90th minute but her cross went past the goal mouth as no Rising player was able to make the connection. Eastern Sporting Union will now face India Rush SC in their next encounter on March 31 while Rising Student's Club will take on KRYHPSA on the same day.